If you're new here, you may want to subscribe to my RSS feed or get daily updates via E-mail. Thanks for visiting! In my last post we have learned how to find saved passwords in Firefox. 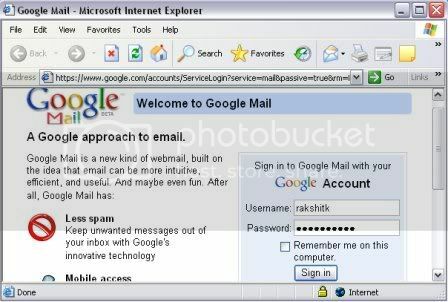 In this article let’s focus on how to hack passwords in Internet Explorer. 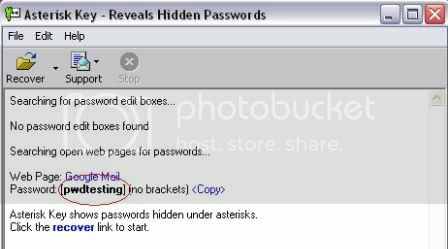 There is a utility named Asterisk Key that can be used to recover saved passwords in Internet Explorer. So many times we tend to forget our saved passwords in web browsers. The reason is simple. Once the password is saved we did not require to type them every time we sign in for any services. So, if you tried very hard to remember your password and got fed up, just read through this article and all your problems will get solved easily. Launch Asterisk Key and also the web pages having saved passwords. If the web page is not open, this utility will not work. Now click on “Recover” button in Asterisk Key and your saved password will get visible along with all other required information. That’s it. It’s very simple. What is your opinion on this great little application? Tomorrow, I’ll be writing on How to reveal passwords hidden under Asterisks (*****). If you like this article and want to get daily updates, do subscribe to my RSS feed or get daily updates via E-mail. Posted April 30, 2008 by Rakshit. Comments and trackbacks are open. Follow the comments feed. Tagged with: asterisk key, find hidden password in browser, Hack password in IE, Reveal password in Internet Explorer. in the address bar. Or does that only work in Firefox? Hi. I’m new comer here…I rarely loose my password. But, I’ll note this post as I’m sure one day I’ll need it. Welcome to my Blog- Aarambh, Leslie. You never know when you need this technique in future, so better be prepared. Hoping to see you more on Aarambh. Refer the 2nd screenshot in the above article. You will find the recover button at the top left. Thank you for teaching me(us) about things I could not find myself at all despite valiant efforts.Thank you again! Glad I stumbled upon this info, I will bookmark this page for future reference for sure. Hey thanks yaar, its working…. nice post dude thanks a lot bro i got my account back. Hi rakshit. I(a KOBRA like u)(u mean wat i get na.. ) would like to have your email-id, if u give. SO that i can get some career- guidance from u related to infosys! !